Even through all of the madness today, we still managed to squeeze in all things reindeer to wrap-up an exciting week of learning. On Wednesday, we read one of my favorite holiday books. I found this little crafty idea on Pinterest and tied it in with a writing review. We have talked, and talked, and TALKED about showing not telling in our writing. 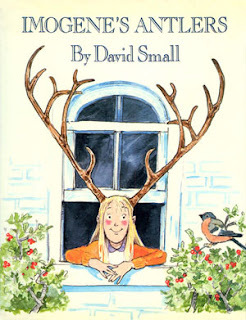 They began by writing a tell me writing to describe their antlers. They then transformed those boring details into a show me writing. Then finally, we were able to cash in our reindeer rewards to make our reindeer chow. Here was our spread...we even threw in a little measurement with measuring cups and spoons. Even though they didn't need ANY help on the sugar end, I loved the way that our chow turned out! This little incentive is definitely a keeper. All of these ideas are included in my Run, Run Rudolph unit. It is still 20% off until midnight! Can I hear a cheer for the weekend???? It was definitely one of those Fridays...my car barreled into the driveway and I had my lounging clothes on in 2.2 seconds. I don't plan on moving until I need more chocolate! I just love your Imogene's Antlers activity! Pinned it :) When I read that book I usually have my kiddos draw a picture of themselves with animal parts (a beak, rabbit ears, etc), and then write about what they would do if they were that animal.